Shortly before overcoming Eastern Cordillera, winds from the Atlantic Ocean unload their moisture as rain and mist, forming one of the richest environments in ways of life of Argentina. The Mountain Rainforests , the Yungas Forests (also known as Tucumano-Oranenses), an unthought extension of the Amazonian massif in the barren geography of the northwest. An almost unknown jungle mass -increíblemente- by most Argentines. It is one of the last refuges in Argentina along with the Atlantic Forest and a portion of dry- chaco for the Yaguareté or Jaguar. From the almost impenetrable Baritú in the north to the southeast corner of Jujuy, to Pintascayo, a large area of ​​Oran, Calilegua, Serranías de Zapla, Acambuco and Aguaragüe ranges, the areas of greatest presence. But with data in such remote areas as Campo Duran in the north, Tineo at east, around the El Rey National Park and to the area of ​​Metán in the south near Tucuman (already in formations chaqueño type), although populations almost unknown and seemingly with little hope of survival. 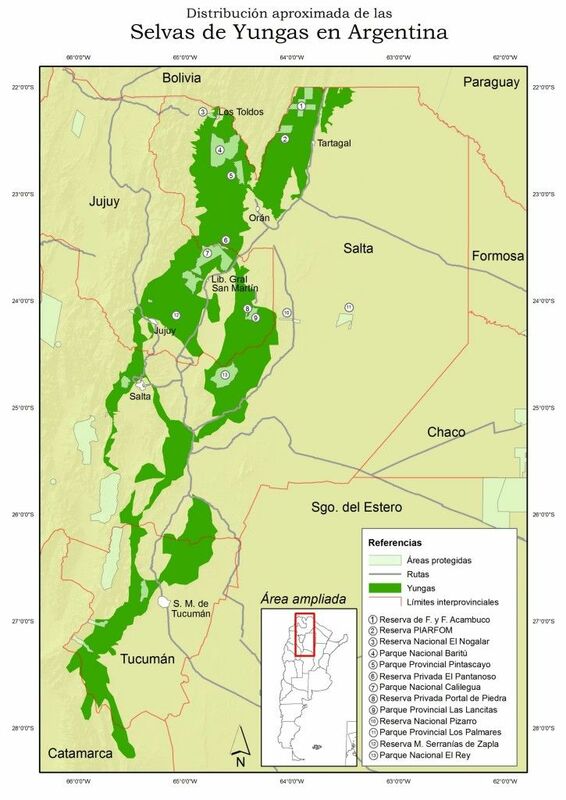 It is unknown the situation in the east of the province of Salta, on the border with Chaco and Formosa, not knowing if there is contact between the populations of the Yungas and the Chaco Seco. The truth is that the Overo, as it is called in these parts, still walking the Argentine Northwest, dodging the man, his bullets and clearings, stealing some calves and some other tambera that eventually cost him his life. Biosphere Reserve of the Yungas between the National Parks Baritú and Calilegua National Park, protects the best preserved area where these cloud forests and sustainable development of natural resources is promoted.